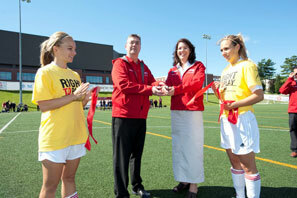 On Sept. 17, BMO Centre was officially opened on the UNB Fredericton campus. Earlier this year BMO Financial announced a gift of $1.75 million, the largest gift to the university from a single corporate partner, with $1 million of the gift going to enhance the Varsity Reds soccer program. With new signs on the clubhouse and around the field, it looks like a brand new facility. Construction is almost complete on the clubhouse attached to the turf facility, with offices, soccer changing rooms and washrooms, and an artificial turf. BMO Centre will be home to the Varsity Reds soccer teams as well as the URec Red Bombers football team and other club sport teams and will be used extensively by the greater Fredericton community. The UNB Varsity Reds will host the 2011 Atlantic University Sport women’s soccer championship and the 2013 Canadian Interuniversity Sport men’s soccer championship at BMO Centre and this funding will go a long way in helping to attract the top student-athletes to UNB.